The author of nearly 20 books, Jin (GRS’94), a College of Arts & Sciences professor of creative writing, was recently inducted into the American Academy of Arts and Letters. “I was very pleased, very surprised,” says Jin, who joins eight other new members of the academy, writers Wendell Berry, Denis Johnson, and Tobias Wolff, artists Robert Adams, Ann Hamilton, and Bill Jensen, and musicians David Lang, and Alvin Singleton. Membership in the honorary academy is among the highest recognitions of artistic merit in the United States and is limited to 250 individuals, with new members elected only as vacancies occur. Jin was elected to the American Academy of Arts & Sciences in 2006. Jin is modest about this accomplishment, the latest in a string of awards marking a writing career that began in the face of nearly impossible odds. When the revolution closed schools in China, 14-year-old Jin enlisted in the army and was sent to the Russian border. Determined to get an education, hepored over any book he could get his hands on, eventually making his way to college, where, at 20 and for the first time in his life, he met someone who spoke English. Learning the new language was so difficult, Jin recalls, that it made his mouth hurt. (Some of his fellow students resorted to painkillers.) 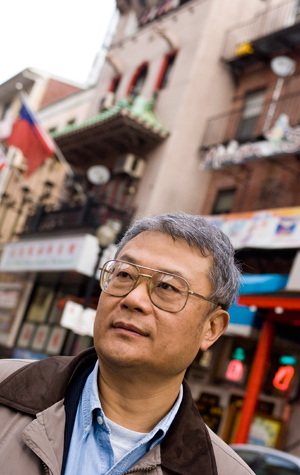 Today, Ha Jin, the pen name of Xuefei Jin, writes award-winning works in English, his second language. All but three of his books are banned in his homeland. Current BU faculty who are members of the American Academy of Arts and Letters include Robert Pinsky, a CAS professor of English and three-time US poet laureate, and Nobel Laureate Elie Wiesel (Hon.’74), BU’s Andrew W. Mellon Professor in the Humanities. Alums composer Samuel Adler (CFA’48) and painter Brice Marden (CFA’61, Hon.’07) also are academy members. Except for her hands, Beth Willer is nearly motionless, back to the audience, a quiet presence in the midst of swirling, ethereal sound. But her hands, as she conducts the Lorelei Ensemble, are in constant motion, looping and circling, lifting the music upward. When Willer (CFA’08,’14) founded the female vocal octet seven years ago as a BU master’s student, she knew she was taking a risk. Today, the group, which presents both new and early music, has a loyal following. They also have critics scrambling for adjectives—mesmerizing, hypnotic, pitch-perfect, pristine, adventurous, eclectic—to describe their sound. Willer, the ensemble’s artistic director, says she hopes that people find the Lorelei experience “ear-opening,” that they will be so immersed in listening that they will be shocked to discover time has passed—and will completely forget to check their electronic devices. “It’s getting harder and harder to hold the attention of an audience,” says the new doctor of musical arts, whoblends the sounds of past and present, ancient and modern, in projects rooted in community and social issues. The Esther B. and Albert S. Kahn Career Entry Award that Willer recently received will help propel her musical vision. “What got me excited is that the judges were interested in art that was crossing boundaries into other disciplines and in projects that were focused on outreach,” she says. “They wanted to hear about innovation, and that’s at the forefront of our mission.” Willer plans to use the $10,000 Kahn Award to devote more time to building the ensemble and designing innovative programs. Established in 1985, the Kahn Awards are funded by a $1 million endowment from the late Esther Kahn (SED’55, Hon.’86), and are presented each year to three College of Fine Arts students in the final semester of their undergraduate or graduate studies. 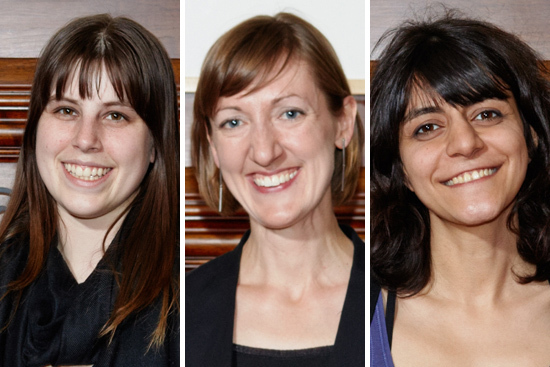 This year’s other recipients are Kayleigha Zawacki(CFA’14), who has completed an undergraduate degree in lighting design at the School of Theatre, and Hoda Kashiha (CFA’14), who graduated Sunday with a master’s degree in painting from the School of Visual Arts. Each year, the directors and faculty of the Schools of Theatre, Visual Arts, and Music choose eight finalists, and the CFA dean and the school directors select three from each school as finalists. Winners are chosen by a committee, this year comprising actor, director, and producer Robert Walsh; Jane Pappalardo (CFA’65), cultural philanthropist, member of the MIT Council of the Arts, and a recipient of the 2013 Commonwealth Award for Cultural Philanthropy; John Harrington (CFA’85), the founder and chief mission officer of Advanced Practice Strategies and a board-certified medical illustrator and contributor to the New England Journal of Medicine, the Boston Globe, and Fortune magazine; and Linda Green (SED’63) and Deborah Kahn (SED’67), the daughters of Esther and Albert Kahn. Winners are chosen based on several criteria: artistic talent and personal statements about their role as an artist in society, their concern for social issues, and their vision for how they will use the award to help launch their career. The trees were part of Zawacki’s thesis project, an exhibition titled Light Conversations, designed to spark discussion on social issues. Every work on display incorporated light as an integral element, giving the static forms a sense of movement. And the tree sculptures included more: first, a soundscape of wind and rustling leaves, then a looming shadow—a performer’s giant hand extinguishing each tree, one by one. The sound of chainsaws. Darkness. A forest destroyed. The work of painter Hoda Kashiha grapples with issues of identity in the midst of constant change, both social and political. “There’s always a challenge to find your true identity,” Kashiha says, thinking aloud about her life in Iran and here in the United States, where she feels she is always explaining herself to others, trying to help them understand who she is.